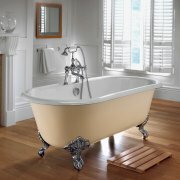 Explore our fantastic range of exquisitely crafted, stylish bathroom suites and furniture with ✅ FREE DELIVERY & EXPERT ADVICE ✅ | Lavish Victorian and Edwardian-inspired styles that echo the past from Period Property Store | Free standing baths, toilets, basins, bidets, taps and much more | Handcrafted ceramic | Traditional high-level cisterns | Cast iron baths | Superior craftsmanship! 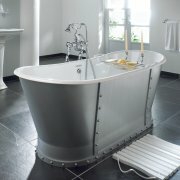 Complete your home with our exquisite range of bathroom suites and products. Our suppliers are known for their individuality and premium quality designs in helping you to create your opulent, sophisticated bathroom. 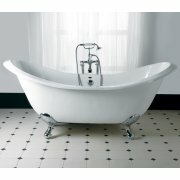 We supply baths, toilets, basins, bidets, taps and much more. 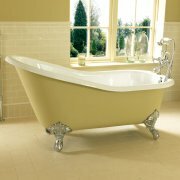 Bathe yourself in luxury with our range of beautiful baths. 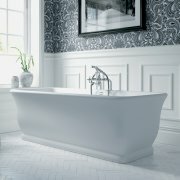 Our extensive collection of free-standing baths are available in a wide variety of styles, designs, finishes, and options. 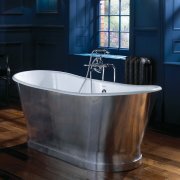 We also supply traditional cast iron baths in designs from subtle to bold - these baths are individually handcrafted with some of the most opulent exterior finishes. 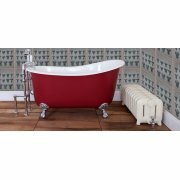 Our suppliers intend to make the pastime of bathing even more enjoyable with their alluring collection of timelessly styled products. We try to honour the heritage of Victorian and Edwardian bathroom styles, and our suppliers utilise tried and tested manufacturing principles. 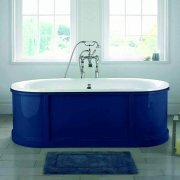 Complete your new bathroom suite with our range of sophisticated suite designs. We offer a variety of styles, from the sleek contemporary to vintage, traditional aesthetics. Our suppliers cater to the connoisseur who enjoys handcrafted luxury. You only need to take a closer look at the finish of any piece of Imperial ceramic, and you will see a flawlessly smooth surface, beneath layer upon layer of brilliant glaze. Every piece of ceramic produced by Imperial is constructed with robust vitreous China for optimum quality. With confident and angular form, the pure white ceramic ware of our collections allow for a range of style combinations. If you’re planning to create a period-style room with low or high-level ceilings, we offer traditionally styled cisterns that can be positioned at high or low level. 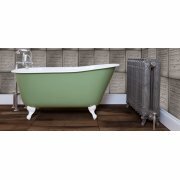 Accentuate your high ceilings with period bathroom classics! Our sophisticated array of bathroom products are produced with superior craftsmanship methods to achieve a lavish look that is also robust. Our suppliers design with luxurious traditional and contemporary properties in mind - their ranges echo Victorian and Edwardian bathroom concepts.